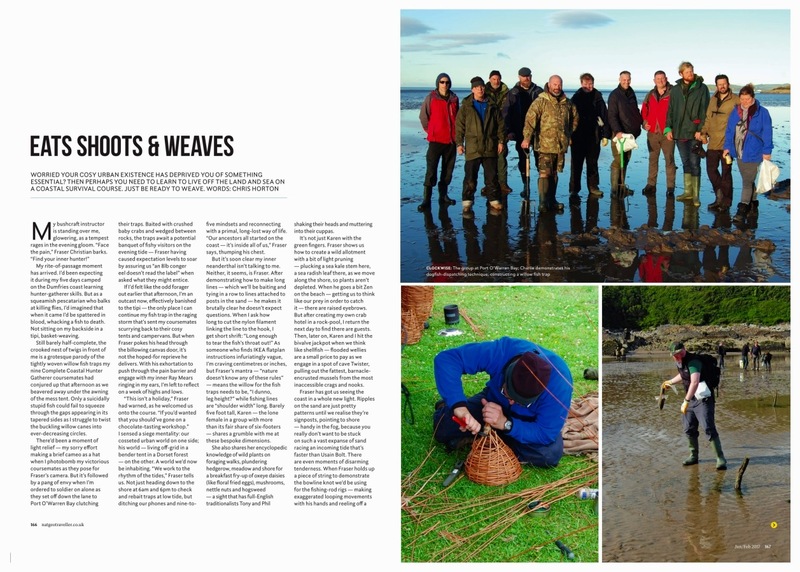 Read about our last Complete Coastal Survivor course together with @allinnaturesweden in this months issue of The Bushcraft and Survival Skills magazine – issue Nov/Dec 2018. 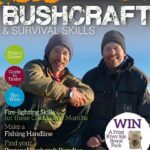 To get your copy click here, a publication that is well worth the read if you are interested in all things bushcraft, you will also find links to get your tickets for The Bushcraft Show, we will be there, 25th – 27th May 2019. If you’d like to make like Ray Mears for the weekend, head to the Welsh coast. On the the Llyn peninsular, the Coast Hunter course will bring out an latent hunter-gather skills such as identifying edible plants, and spear fishing. The style of the instructors ensures that the purpose of the course is squarely on having fun and picking up knowledge, rather than on hard-core endurance, but you will be camping out (having learnt how to set up camp yourself, of course) A good nights sleep is guaranteed, however, after a dinner of seaweed risotto cooked to perfection with oysters and whelks over the fire (£125; coastalsurvival.com). “The good thing about the beach is that there’s always plenty of protein around,” says Fraser, my guide, as he cuts a limpet from a rock with his blade. He inspects the grey gooey creature, and slices into its raw flesh. Flicking off any stray bits of sand and grit, he hands me a piece with a mischievous grin. I take the measly offering without a second thought. Having clambered over rocks, dug a shelter, built a fire from scratch and munched on numerous weeds and plants, I’m determined not to lose face now. Plus, I’m starving. I smile back and pop the limpet in my mouth. It’s actually not that bad. To think people splash their cash on shellfish in posh restaurants when it’s right here for the taking. A few miles from the pretty seaside town of Lyme Regis, we’re hardly in the wilderness, but, as Fraser explains, the skills we learn here can be used anywhere in the world. 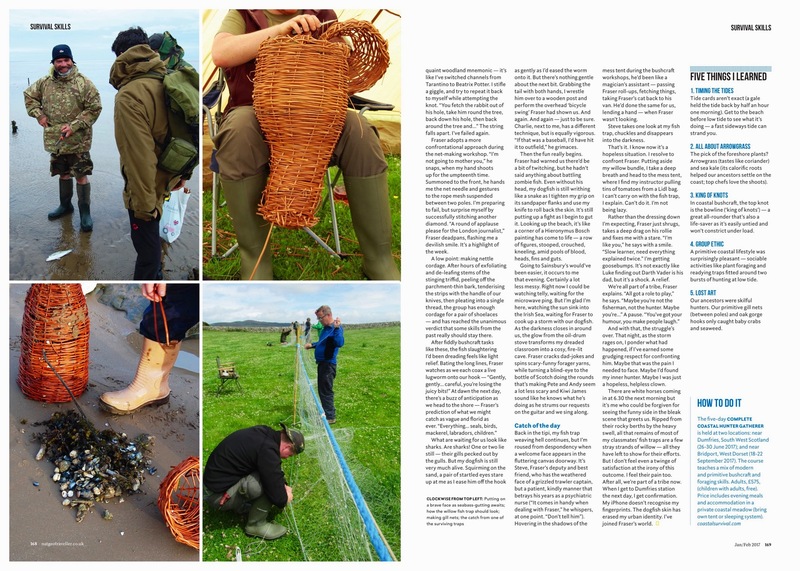 “Making traps, finding wood, boiling water, foraging and putting up an emergency shelter are skills that can be used anywhere – you just need to have confidence and keep your wits about you,” he says. Having trained with the Royal Marines and actually lived in the woods and on the beach for a while (he’s just one of those characters), Fraser knows what he’s talking about. He’s also a big foodie, and is always keen to apply his cooking skills to the ingredients he finds all around him. Survival students won’t be eating baked beans on his watch. Every step he takes is with great care, and he’s scanning everything around him for possible uses, tastes, and tools. For Fraser, this is a way of life, and anyone who wants to escape the daily grind and fend for themselves should join him on his adventure, if only for a couple of days. Lee Williams speaks on behalf of The Staff Canteen to a professional forager, nutritionist and survival expert, Fraser Christian, who lives and works in West Dorset. Fraser has worked with River Cottage and provides wild ingredients to 2 and 3 star restaurants. You were a professional chef before you got into foraging. How was that and why did you change careers? I’d worked in a kitchen since I was 15 then I went to Brunel Technical College in Bristol where I graduated with 99% in my practical exam, the highest exam result of any student ever in the college. By the age of 19 I was already second chef at a four star hotel with three rosettes, but in the end the repetition of using the same ingredients and the long hours – sometimes 97 to 100 hours a week – began to put me off. I decided I wanted more quality of life and being quite individually minded, I wasn’t afraid to change careers. What attracted you to foraging? I grew up in the country and I’ve been in the woods ever since I was a kid. It’s in my blood. My great-grandfather was one of the most famous gypsy horse doctors. He used to treat all the gypsies’ horses with anything a vet couldn’t cure using herb and hedgerow remedies. I grew up shooting shotguns and poaching so I guess the gypsy blood has always influenced me! And how did you get into foraging as a career? When I first left cheffing, I bought a camper van and went off travelling around Europe. I lived in India for three months where I helped an Indian family with running their cafe. When I came back to the UK, I worked for River Cottage. I was the lead host and chief instructor on all their fish-based events for three years. 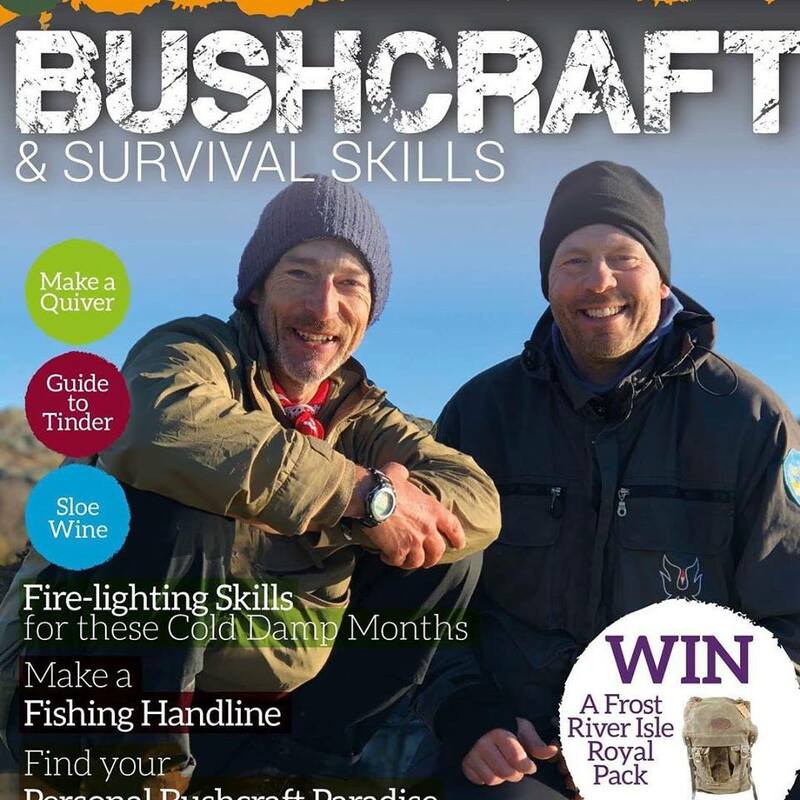 After River Cottage I qualified as a chartered skipper and started to run my own fishing trips. It really took off for me after the tsunami in 2004. A group contacted me that had done the post-tsunami relief work in Thailand. They wanted someone to create a post-apocalypse beach survival course to help teach the skills that they wished they’d known when they were out working in Thailand. 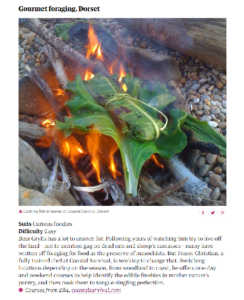 After that I set up my own Coastal Survival School here in west Dorset and a separate foraging website called wildforage.co.uk. From there I got into supplying wild ingredients to restaurants. How is that side of business going and what are the most in-demand ingredients? It’s going really well I’ve supplied over half a dozen Michelin starred restaurants. This year I’ve already got a couple of two-star restaurants on the books, L’Enclumeand Whatley Manor. Most demand is for sea vegetables – things like samphire obviously; sea beet is very popular at the moment and various kinds of seaweed. Do you often forage for yourself? I won’t lie and say that’s all I live off. Like everybody, I’ll have the occasional frozen pizza when I’ve been working till nine or ten in the evening, but yes I’ll often pick up a few wild bits and bobs when I’m out in the van and throw them in a stew or use them to supplement what I’m eating. Yes Dulse, it’s a red seaweed with a slightly unusual but well-balanced flavour, not too salty. It’s traditionally put into bread in Ireland. And a favourite meal with that? I do a really nice three-seaweed risotto with red seaweed, green seaweed and brown seaweed. I’ll use something like sea lettuce as the green one, dulse as the red one and then kelp as the brown. You get a great balance and between all of them they’re a complete super food with every single nutrient the body needs except vitamin D.
Sounds lovely! Foraging is going through a boom in popularity in professional kitchens at the moment, why do you think that is? A chef can get 20, 30 maybe 50 different kinds of vegetable from a greengrocer but you can get more than a hundred different kinds of wild plants that nobody’s used before. So it’s exciting for chefs because a chef is like a painter, there are only so many different combinations of colours you can come up with so using wild food is like having a larger palette of colours to paint with. What’s the future of foraging both for chefs and the public at large? In terms of restaurants hopefully, when the cost comes down, it will filter down from just the high-end places and everyone will start using it. At the moment I sell wild spinach at between £30-£60 per kilo, which only top-end restaurants can afford. In the end it will filter down and get cheaper but it might take time. In terms of the public I’d like to see more and more people getting into it just as a nice healthy activity. It’s all about getting outdoors and reconnecting with lost knowledge and for me it’s part of the cure of our modern health problems. We’ve got an obesity problem. There’s on average two and half grams of salt and two and a half grams of sugar in every ready meal plus all the chemicals. Modern food is poisoning us. Anything that we can offer that provides an alternative has to be worth it. If you go and buy a ready meal you won’t digest hardly any of it because there’s no connection with it. If you want to get the most from your food, you need to go out and touch your food, pick you food, prepare and cook your food; you build up a connection with it and it builds up your digestive juices. By doing that plus the fresh air and exercise that comes with foraging, you only need a tenth of the food and you’ll get a hundred times more nutrition than something that’s mass produced from the shop.